Douc langurs are found in Southeast Asian countries of Cambodia, Laos and Vietnam. The beautiful red-shanked douc langur is only found in north and central Vietnam and Laos. Its habitat is in the lowland to montane primary and secondary rainforest where it lives in the mid to upper levels of the canopy. similar colors, but are missing the white rump patches. It is sometimes called the "costumed ape". The name douc is an ancient name of Vietnamese origin. Like all langurs, the red-shanked douc langur is a long slender monkey. It is part of the colobine monkey family, but surprisingly is more closely related to proboscis monkeys than langurs. Its overall size is 61-76 cm, with males slightly larger than females. Males weigh approximately 7 kg, and females 5 kg. Their tails are about 56-76 cm long. Mating takes place from August to December. The pregnancy lasts 180 to 190 days resulting in the birth of a single offspring just before fruiting season of some favorite foods. The young are born with their eyes wide open and they cling to their mothers instinctively. Their body color is lighter than those of the adults, with short downy gray hair and a dark stripe down their back. Their faces are black with two light stripes under the eyes. They get their adult colors at about 10 months. Females reach sexual maturity at about 4 years, while the males reach it at 4-5 years. They have a life span of about 25 years. Red-shanked douc langurs are diurnal and eat, sleep and feed in the trees of the forest. They use their arms and legs to move through the forest along established routes. They will often jump from branch to branch, holding their arms out over their heads and pushing off with their legs, landing feet first on the next branch. The troop is led by adult males, with females and infants in the center, while the juvenile males bring up the rear. When they are relaxed, they will move noiselessly through the forest. They can move quickly and soundlessly through the trees if alarmed. But when startled, they give loud barks and rush around the trees slapping branches with their hands. Much of their time is spent digesting food, grooming and dozing. 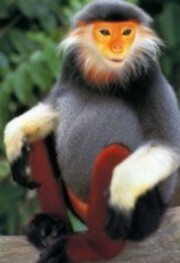 The diet of the red-shanked douc langur consists mostly of leaves high in fibers. One of the many species of colobine monkeys, or leaf-eating monkeys, they have large stomachs which are divided into sacs containing bacteria that break down the cellulose in leaves, which give them their pot-bellied look. This also makes them burp a lot from the resulting gas. They prefer to eat small, young and tender leaves, but will also eat fruit like figs, buds, flowers and bamboo shoots. They get all the liquid they need from the food they eat, and don't need to descend to the ground to drink. They are messy and chaotic feeders, dropping much of their food onto the forest floor. They eat peacefully together, not quarreling over their food, and have been known to share it with others. The main predator of the red-shanked douc langur are humans. They are threatened throughout their limited range by habitat destruction and hunting. Native people hunt them for food and body parts, which are used in traditional medicine. There is also a very lucrative and illegal wildlife trade for the red-shanked douc langur. During the Vietnam War the douc habitat was heavily bombed and sprayed with defoliants like Agent Orange. Soldiers also used them for target practice, it is said. The red-shanked douc langur is on the IUCN Red List of endangered species, and CITES I prohibits international trade. However, Vietnamese laws protecting the douc langurs have been difficult to enforce. "The IUCN Red List of Threatened Species", http://www.redlist.org/info/captions.html (3/20/03).